After too many weeks of “training by feel” I have finally written down an eight week training plan for the remaining time approaching the Indianapolis Mini Marathon the first weekend in May. I am excited to be tracking results as I have in the past! I’m using the FIRST training program again since I had good results from it last time. I bought the book some time ago and I still use it regularly. It was probably one of the best purchases I’ve made for training. Here’s the outline. I have more details on my version as to specific pace, distance, etc. I of course adapted the program slightly for my own needs and from reading about tips from elite runners. It’s amazing what you can pick up for advice by reading blogs and Runner’s World Magazine! I’m going to return to doing a post run ice bath once my mileage climbs a little higher and I’m lifting weights before a couple of my run days so my recovery days and rest days are truly for rest and recovery. Overall my knee is still feeling well though I can tell from a little stiffness that taking it easy and continuing to work into the harder stuff is a wise decision. This morning I did intervals after weights and pushed the 2peed a bit on 1200m sprints. My knee was feeling a bit, but felt good afterwards. Last week I added my first long slow distance run (LSD) of the season and it felt good to get out there on the trail for an hour or so. This coming weekend looks to be a 12-miler on Saturday. I fully plan to have some fun on St. Patrick’s Day so I’m switching my rest day to Sunday to accomodate the change in schedule. As I’ve said before, it’s important to schedule some celebration days into your program so you don’t go crazy! So now that you are singing that 1983 hit from Matthew Wilder (or you are now) please keep reading as you hum! Also, as a little fun fact…I’m surprised at how many people online think the Australian rock band “Men at Work” sings that song. Thank you Youtube and thank you Wikipedia. Since my last check-in here at the wide world of WordPress I’ve been hitting the gym almost daily only missing one day last week. I take the weekends off from the gym to recover, but use my time wisely each morning Monday – Friday. Everything has been going great and I can say that my Indianapolis Mini-Marathon training is back on track. This is good since I have just 65 days left! This morning was an interval session on the treadmill also known as speed work. This was my first interval training since December and maybe even November of last year. I warmed-up with a single mile at a 10min/mile pace and then jumped into 400m (1/4 mile) intervals. Here’s how it panned out after the warm-up. I was feeling so good at the end of interval #5 that I decided to finish up and not do the rest interval. Instead I kicked it up a notch to an 8:34 pace and then went into cool-down for a half mile again at a 10min/mile pace for just a half mile. As I type this out I’m sitting at my desk drinking my EAS AdvantEDGE shake. Remember, recovery and nutrition is a key contributor to success. As for my next speed workout, I’m looking forward to throwing in some 800s. Otherwise my plan is to do all my warm-ups, cool-downs, and easy runs at a 10min (6mph) pace. I’m unsure at this point if I have enough time to train well enough to hit my sub 2-hour half goal at the mini-marathon, but it’s more of a 2012 goal than a mini-marathon goal so we’ll see. Until next time, Happy Training. The greatest spectacle in racing! The Indy 500 was dubbed thus so many years ago and this year Indy is in the midst of celebrating it’s 100th year of memories spanning from 1911 to present day. The Indy Mini-Marathon started in 1977, bringing in Olympic champion distance runners Frank Shorter and Bill Rogers. In 1979, the Mini-Marathon became an official 500 Festival event. The event grew rapidly in the 1980s and even more throughout the 1990s. 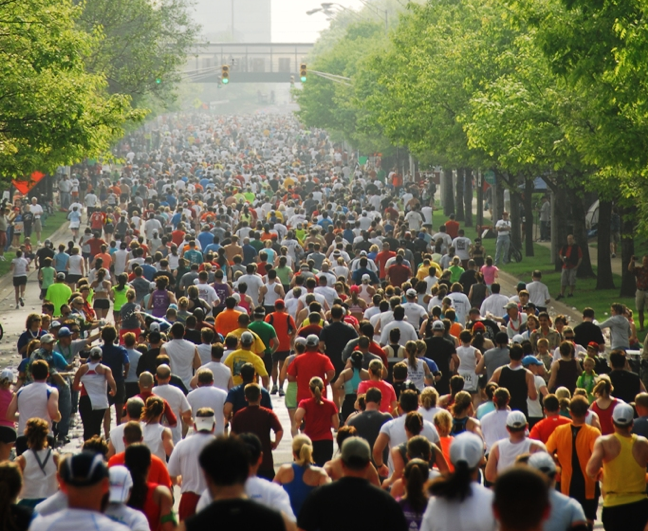 Today, the OneAmerica 500 Festival Mini-Marathon is noted as the nation’s largest half-marathon with a field of 35,000 runners and walkers participating each year. The course is flat, fast and allows participants to run the 2.5 mile Indianapolis Motor Speedway! But enough with the history lesson! This past Saturday May 7th was perfect for running in Indianapolis. The morning brought temperatures in the mid-50s and the winds were quiet. Last year (2010) I ran “The Mini” in 02:33:25 and was very happy with my time as I had been training for 5 months and had just started my fitness journey and lost about 20 pounds. My time was 22 minutes faster than my 2009 time. This year I ran the 13.1 mile race in 02:05:49 approximately 18 minutes faster (and another 35 pounds lighter) than my 2010 race. Besides having an extra 12 months of training I tried a few more things this time around to improve my performance this year. First was knowledge (or information would perhaps be better way to describe it.) I’ve been having trouble keeping a consistent pace recently. Basically, I go out too fast which is a common error for new runners. You feel good, you run fast and then you crash hard on the second half of the course. 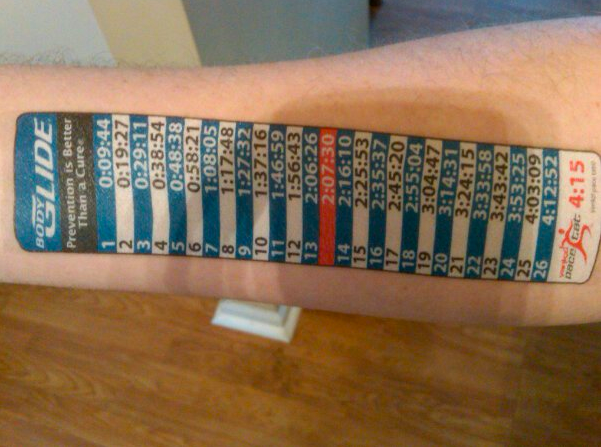 This year I wanted to run a more consistent pace throughout the race so I strapped on a temporary pace tat so I could keep tabs on my pace throughout the run. This is also a lot cheaper than a GPS watch (though I’ll be adding that to my Xmas list this year too)! These are very good if you are wondering. I could still use the tat for a run three days after the race. It has survived a half-marathon which ended with rain and several showers! Next, leading up to the Indy Mini-Marathon I was reading a book called “Racing Weight” by Matt Fitzgerald and in the book the author mentions how performance is effected by various factors like hydration and muscle glycogen. Of course everyone realizes that being hydrated is a good thing. Don’t drink enough water during a long run and eventually you’ll slow down or stop altogether as your body has trouble cooling itself and your blood gets thicker from having less water in it. 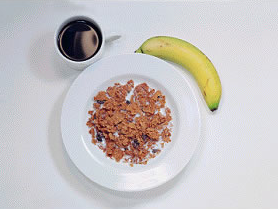 Next, most of us know that we need fuel (carbs) during a long run like a half marathon. We take sports drinks with us and consume gels like GU along the race course. What I didn’t know was that exercise induced muscle damage causes fatigue separately from hydration or fuel availability. So I looked into using a product that would help this third performance limitation. I found a product called Accelerade from Pacific Health Labs which has a combination of carbs and protein to help limit muscle damage from prolonged exercise like a marathon or half-marathon. The company also makes a gel called Accel. So I bought some Accelerade and instead of taking GU on my 13.1 mile fun run I added some Accel gel to my run pack. Now I will say that from training for a year I was in much better shape and I did run a much smarter race with my pace tat, but still I liked the Accel gel and I did feel like I had a lot more energy during the mini-marathon. The consistency of the Accel gel wasn’t as thick as a GU gel so it was a lot easier to take and I didn’t feel like I needed to wait until I was near a water station to have something to drink with the gel like I do when I use GU. I still like GU, but I’ll be using Accel a lot more in the future. Another thing I can say is that the day after the mini-marathon my legs felt great and I never experienced the pain that shows up two days after such an intense exertion. When I ran the Kansas half-marathon four weeks ago (in 02:11:37) my legs were tired the next day and I did experience the major stiffness that usually comes 48 hours after (called DOMS). So the Accelerade (taken pre & post race) along with the Accel gels seemed to help me recover faster than with just GU and a whey protein shake per my usual routine. So my experience at The Indianapolis Mini-Marathon was great! I even made it onto the local news on WTHR. I had a half dozen of my friends tell me that they saw me on the news running around the Indy 500 Motor Speedway. Now I have 5 weeks to continue training for my next race (another half-marathon). I’m excited to continue using Accelerade while I train and to use the Accel gels for my next half. My recovery workouts this past week have been very good and I’m ready to jump back into training on Monday!